I could not be happier for the resurgence of the 70s retro silhouettes and colors that are back in style right now. 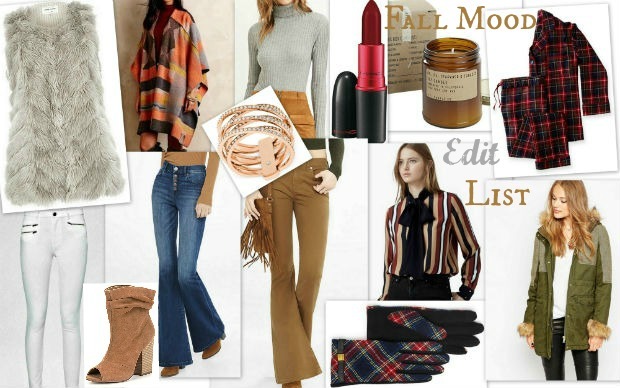 I love everything about that throwback vibe – from bell bottoms, rich plaid, and earth tones to flare jeans. What I mostly like about this trend is how a nice pair of flare jeans when paired with my heels or platform shoes can elongate my petite frame - making me appear taller in an instant. It's no wonder that currently my fall mood is for the 70s inspired fashion and luxurious textures from faux fur, oversized ponchos, classic plaids, flare jeans, winter white jeans, bow blouses (an old uniform) to ribbed turtlenecks, stack pave bling, dark red lips, slouched camel booties and new scents for the home. I'm also definitely getting my hands on my first ever parka this year and last but not least, a necessary pair of sophisticated tartan touch sensitive tech gloves.